The wedding cake itself is simple enough – iced with a lovely buttercream icing. But what makes it really incredible is the sea of bubbles that surround the bottom of the cake. It’s almost as though the cake is floating on the bubbles. And these aren’t any ordinary bubbles either. They are blown-sugar bubbles that were created to look like the bubbles you find in a glass of champagne. 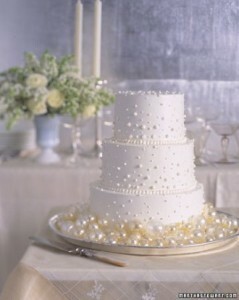 The cake is also embellished with piped buttercream dots which continues the bubbly theme. This cake would be perfect at any time of year, but it would be especially festive around the holidays or at a spring or summer wedding. You can find this bubbly wedding cake here.